Wet Weekend Love Kit W37000. The Wet Weekend Love Kit includes one 3.7 ounces Wet Warming Lubricant, one 3.1 ounces Wet Platinum, one 3.5 ounces Wet Light Lubricant, one 3.5 ounces Wet Flavored Lubricant, and a re-usable zip-bag. Wet Warming Gel Lubricant Turn up the heat! Gently heats on contact and warms with motionâ€¦Blow on it, it gets warmer. Wet Warming Gel Lubricant is silky smooth, long lasting, water soluble, harmless if ingested, and latex friendly. Lick it and feel the heat between your sheets! Wet Platinum Premium Lubricant guaranteed never sticky, this premium lubricant is our longest lasting formula. It never dries so it leaves your skin feeling soft and moisturized. It does not break down in water so try it in the bath, shower, or spa. It is also great for full body massage and skin conditioning. The silky smooth 100% silicone formula is latex friendly and doctor recommended. Wet Light Liquid Lubricant is a thinner, lighter, liquid version of Wet Original. It is also water-based, gentle, odorless, colorless, non-staining and long lasting. Made with pure, soothing Aloe Vera and Vitamin E, it is great for sensitive skin. Wet Light Liquid Lubricant is latex condom compatible and approved as medical device product. It simulates the bodyâ€™s natural fluids and is recommended by doctors and health organizations. For comfort or pleasure, you can count on Wet Light! 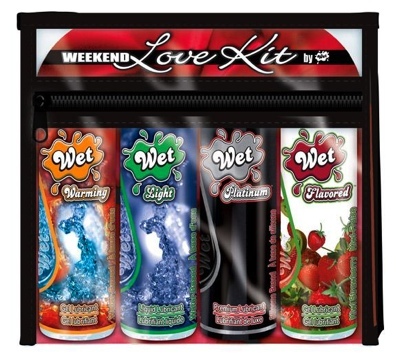 Wet Flavored Gel Lubricant This lubricant is pure fun! With all of the benefits of our water-based formulas, Wet Flavored lubricant taste like real fruit with no bitter aftertaste. It is silky smooth, sugar-free, colorless, non-staining, and latex friendly. Pour it on for a tasty treat! Feels Delicious! Available in Six Award Winning Flavors: Kiwi Strawberry, Passion Fruit Punch, Pina Colada, Wild Blueberry, Sweet Cherry and Watermelon. Assortments may vary. Whether you need a little or a lot, Wet has you covered. Our line of high-quality, innovative and unique products is formulated using only the finest ingredients at an FDA-approved facility, meeting the strictest manufacturing standards. Distinctive packaging design is the exclusive trade dress of Wet International. Bottle Patent Pending. Distributed by: Wet International, Valencia, California 91355 USA 2005. Made in the USA .